Marshall University history students have the opportunity to contribute to the digital commons through Clio, a free tool that highlights thousands of historical and cultural sites throughout the United States, curated by the crowd. 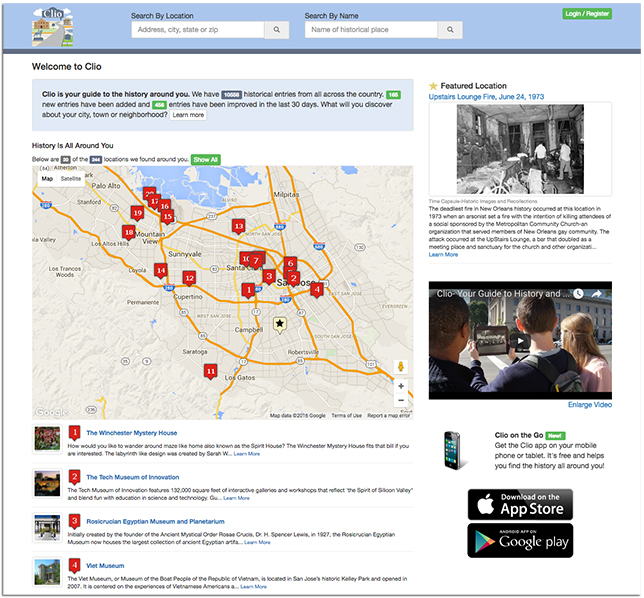 Clio guides users to nearby landmarks and provides links to relevant resources. In 2012, history professor David Trowbridge was at an academic conference in Indianapolis, and on his lunch break he used Yelp to find a nearby restaurant. After lunch, as he wandered around downtown Indianapolis looking at some historical monuments, he wished he had a Yelp-like tool to provide background information on what he was seeing. "I thought someone should create a tool like that," recalled Trowbridge, associate professor of history and director of African and African American Studies at Marshall University in West Virginia. He actually contacted Yelp and a few other mobile software companies with the idea. Although they were intrigued, he said, those companies were not interested in creating tools that send users to external sites for more information. So with royalties from a book he had written, Trowbridge took it upon himself to fund the creation of a free history-based mobile app called Clio (named after the Greek muse of history). Working with Huntington, WV-based tech company Strictly Business, he created a prototype and had his students create entries. "When they came back from spring break, they had used the early version of Clio to go see some of the things their classmates had created," he recalled. "That is when it hit me that this wasn't something just for travelers and people really engaged in history. My students used this in their free time. That had never happened before." Clio can help people discover the past surrounding them through geo-linked images, video and text. The app picks up a user's location and displays nearby historical and cultural sites; users can also perform their own searches by location or name. Each entry offers turn-by-turn directions as well as links to relevant books, articles, videos, primary sources and credible websites. Clio can guide users not just to the sites they are already familiar with, but places they might have missed, such as little-known sites with historical significance. "You can see a sculpture and listen to the artist talk about his or her inspiration for it," Trowbridge said. Trowbridge and Strictly Business worked through design decisions about how to fit both historical information and a comment section on a small screen, but the real challenge was to figure out a crowdsourcing model that would allow the entries to be vetted in some way. "I had nightmares of people trying to find a museum but someone had put in the wrong address or information that was incorrect," Trowbridge said. "We wanted to blend the best part of academia and the best part of crowdsourcing." Eventually, they developed a system in which there are multiple credential levels. Anyone can create an entry, but initially the entry goes into draft mode. Once it is reviewed and edited by faculty members or historical societies, the entry is added to the site. Trowbridge started using Clio in his history courses at Marshall. "I teach a number of history classes where students conduct original research. I wanted to do something besides have a file cabinet full of their research in my office," he explained. "This is a way to share original research that I knew people in the community would care about." For instance, students created entries about sit-ins during the civil rights movement that no one had ever researched. "I love the idea of being able to stand at a place where that sit-in happened and read about it and see pictures and hear voices of people talking about that event." Because the project doesn't have a marketing budget to work with, Clio usage has spread gradually through word of mouth. Trowbridge started with friends and colleagues as well as historical societies he thought would be interested. Last year, New York University professor Peter Wosh started using Clio in a graduate course he teaches called Introduction to Public History. "I am interested in figuring out ways to get graduate students to communicate historical content to more general audiences. This seemed like an ideal way to do that because it forced them to think about how you take a complex historical site; consolidate the information to make it interesting and attractive to a general audience; [and] do a little bit of research to find good images to go with the entry," he said. "It also allowed a back-and-forth between the instructor and students, because they can do drafts and revisions. I implemented it last fall and it went really well. Students got excited about it because for them it was an opportunity to do something real. We got to see their entries available for people." In spring of 2015, the Clio project received a grant from the Knight Foundation that allowed Trowbridge to hire students to create and edit entries. He said he has been amazed at how fast the app content has grown. At the time the Knight grant was obtained, he had about 3,000 entries. That number grew to 5,000 by the end of the summer of 2015. Today, there are close to 10,000 entries. Trowbridge also recently received a Whiting Public Engagement Fellowship to improve the platform by adding interactive walking and driving tours. The fellowship will allow him to expand the app's content and build up the network of scholars, historical societies and museums that contribute. Although financial sustainability is essential to any digital project, Trowbridge said that one of the great things about Clio is that it didn't start with a grant. "Projects that start with a grant usually stop when the grant funding runs out," he said. "This started with passion, so not getting a grant — which is a reality everyone has to be prepared for — will never stop us from doing this."